By Thomas M. Mengler, J.D. As president of a Marianist Catholic institution, St. Mary’s University, I am deeply troubled by the newest executive order banning refugees from predominantly Muslim countries entering the United States. Though the constitutionality of this second executive order may be uncertain as litigation now proceeds to the appellate level, President Donald Trump’s March 6 revised executive order on immigration policy still raises the serious concerns that led more than 140 presidents of Catholic colleges and universities to sign a statement expressing opposition to President Trump’s Jan. 27 executive order. This statement draws on core teachings of the Catholic Church, as well as on Catholic higher education’s long, inspiring history of providing access and opportunity to immigrants. I signed it, as did the presidents of San Antonio’s other two Catholic universities, Denise Doyle of Incarnate Word and Diane Melby of Our Lady of the Lake. More than a century ago, immigrants were pouring into our country from places that were not the traditional homelands of U.S. citizens. Most of them believed in a different religion. Many were poor. Their rituals were strange. Many did not speak English. For many in this country, these are our ancestors — our grandparents or great-grandparents. Many, indeed most, of the immigrants were Catholic — from Ireland, Germany, Italy, Poland, and other parts of Eastern Europe. They were seen as a threat to the Protestant core of the United States. During that time, my mother’s father came to the United States from Poland, and my father’s parents came from Czechoslovakia. The Know-Nothing Party ran candidates who actively opposed Catholic immigration. The Ku Klux Klan used fear and violence to intimidate the new arrivals. The most potent charge of this opposition was that these newcomers would bring with them radical political beliefs — that instead of being loyal to the United States, they would instead follow the secret, mystical and dangerous dictates of the leaders of their religion. San Antonio saw a surge of German immigrants in the mid-1800s, and St. Mary’s was founded by four French Marianist missionaries, not far from San Fernando Cathedral, on Aug. 25, 1852. The year before, French Ursuline sisters opened a girls’ school downtown, and St. Mary’s was a school for boys. From Day 1, St. Mary’s welcomed children of all nationalities and religions. St. Mary’s originally was intended to serve the Spanish-speaking people in the region, but a significant number of the students were French. The then-St. Mary’s Institute was often referred to as “The French School.” Teachers were called “Monsieur” instead of “Brother,” even though English and Spanish were the official languages of the school and German was spoken widely in the area. This brief history of St. Mary’s University is similar to the histories of our more than 200 Catholic universities. Catholic colleges and universities were established to welcome and educate immigrants — Jewish, as well as Catholic — often because no one else would. From this vantage point, I am troubled that some in our country again try to use religion to divide us, to separate loyal Americans from “the other.” One hundred and fifty years ago, “the others” were Catholics. Now they are Muslims. Our Catholic faith calls on us to “welcome the stranger.” We certainly recognize that in the 21st century, this cannot mean open borders. We understand that the United States must ensure the safety of its citizens and have an immigration system that includes the thorough vetting already in place. But in a system with these checks and balances in place, why, particularly in the case of refugees, would we victimize those who are already victims of brutal and oppressive regimes? The Catholic Church’s position on this issue is clear and has been so for a long time. One of the first acts in Pope Francis’ papacy was to travel to the island of Lampedusa, saying a Mass for the many immigrants arriving there on boats from across the Mediterranean Sea and mourning those who lost their lives making that trip. Pope Francis’ action follows a succession of popes, including St. John Paul II and Benedict XVI, who have spoken and acted in support of migrants and refugees. Following the leadership of the popes and bishops, Catholic organizations have been serving the needs of migrants for decades. Catholic Relief Services, for example, helps refugees around the world, including those in Iraq and countries near Syria that have absorbed many people fleeing the violence of tragic civil war. Here in the United States, Catholic Charities helps to welcome and settle immigrants of all faiths. In the Archdiocese of San Antonio, it does the same: From airport pickup to food, clothing and lodging to interpreter services and cultural orientation to employment and education assistance, Catholic Charities is there every step of the way. Our own good shepherd, Archbishop Gustavo Garcia-Siller, has pledged to continue to stand in solidarity with immigrants, refugees, widows and orphans — as Jesus commands us — while our country reforms its immigration process. The Catholic Church knows firsthand that refugees are not our enemies. They are fleeing the same terrorists who would do us harm, and refugees can be our allies in this fight against senseless violence. We should be welcoming them, letting the world know — by our actions — that the United States remains a beacon of hope, giving life and light to those who would tell Muslims that we are their enemy. It has been generations since our Catholic colleges and universities were necessary for the protection of an oppressed immigrant group. Now those of all faiths come to our campuses, seeking an environment in which faculty and staff members foster the formation of faith and enduring values in students. Our Muslim brothers and sisters are an important part of our academic communities. From 2010 to 2015, the percentage of Muslim students enrolled at Catholic colleges and universities more than doubled. I encourage us all to act out of a love that is the basis of our faith and the hope that established religious freedom as a constitutional principle, as well as a respect for the dignity and value of every human person. 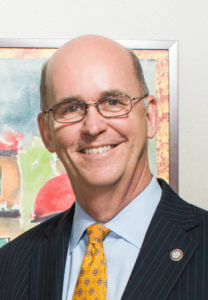 Thomas M. Mengler, J.D., is the 13th president of St. Mary’s University.